Dr. Louis Creed (Jason Clarke) moves with his wife Rachel (Amy Seimetz) and their two young children from Boston to rural Maine. There, the family discovers a mysterious burial ground hidden deep in the woods near the family’s new home. When tragedy strikes, Louis turns to his neighbour, Jud Crandall (John Lithgow), setting off a perilous chain reaction that unleashes an unfathomable evil with horrific consequences. When Stephen King finished his novel, Pet Sematary, he put the manuscript away fearing that he had gone too far. It is undeniably intriguing that this is the story that scares the writer of such horror classics as The Shining and IT the most. Having read Pet Sematary three times I can understand why. You see, I believe that I am reasonably safe from any evil deep within Derry, Maine. I am (for many reasons) unlikely to visit any room in the Overlook Hotel. Meanwhile, I am unlikely to meet a rabid dog, a fire starting child or a teenager with a severe case of telekinesis. However, I could lose someone I love to a freak accident. I (or, again, someone I love) could fall ill to a terrible disease - an illness that may well inspire the iconic Pet Sematary catchphrase: sometimes dead is better. This is the haunting terror of Pet Sematary. In this novel, King explores and evokes the universal fear of loss and grief. And King knows that we scare when we care. He takes his time with the Creed family. We get to know them before the inevitable horror and tragedy unfolds. This is where the movie falters. Pet Sematary looks good (thanks to brilliant cinematographer, Laurie Rose), has some effective moments and features an impressive cast. However, the film believes that the power and horror of Pet Sematary lies in the burial ground itself - and what arises from that earth. This is not the case. In fact, the key to Pet Sematary is not in feline jump scares and misty woods. It is in Rachel Creed’s agonising experience of her sister’s terrible disease. It is in the heartbreaking prospect of a child’s first encounter with death. It is in a parent’s deepest fear about losing a child. 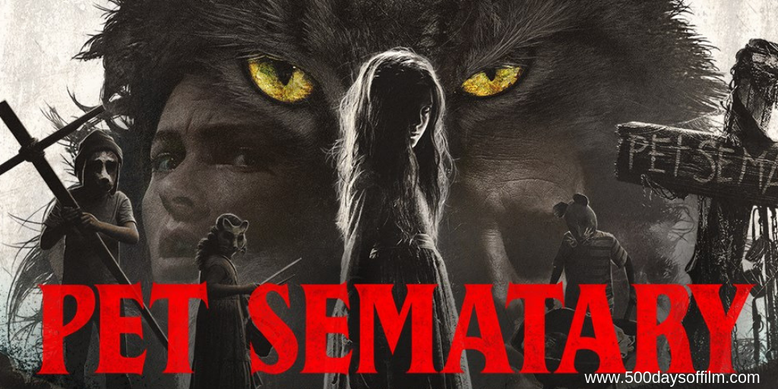 By making what is essentially a quiet, quiet bang movie and neglecting to spend crucial time developing its characters and exploring their grief, Pet Sematary fails to unnerve, much less scare. This is a story that needed to follow a more character-driven, atmospheric path - I’m thinking Lake Mungo or, even, Hereditary. That is not to suggest that Pet Sematary is a bad movie. It is okay and will very likely do good business at the box office - particularly in our post IT (remake) world where we cannot get enough of the King stuff. However, I was left disappointed. Pet Sematary deserved better. I haven't included the Pet Sematary trailer because it just gives too much away. Have you seen Pet Sematary? If you have, what did you think of this film? Let me know in the comments section below or, alternatively, over on Twitter. You can find me @500DaysOfFilm.